On October 6th, 2018, it’s time to get ready to bring the family to Bissell Park. There will be pumpkin carving, pumpkin judging, pumpkin ice cream and other fun activities. And, as a very special treat for one and all, there will be a pumpkin carving demonstration by a professional carver. 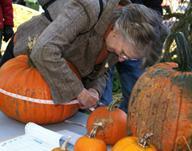 Sensational Elora will provide pumpkins for carving or bring your own pumpkin already carved or decorated. The results will be judged by the attendees. There will be entertainment throughout the event including music, dancing, cheer leading, face painting and more. Seed Distribution: During previous years, Sensational Elora distributed packages of pumpkin seed through the local schools. We asked the students to grow them during the summer and bring them to pumpkin day to be carved, decorated, etc. Since 2016, we have changed our program. Instead of pumpkin seeds, we will be distributing seeds for native pollinator plants through the schools throughout October. Tiny pollinating insects are crucial to life on Earth. Bees, moths and butterflies are all needed to pollinate plants, including fruits and vegetables – a total of one-third of the food we eat. Pollinators ensure the reproductive success of plants and the survival of the wildlife that depend on those plants for food and shelter. However, pollinators are in decline due to pesticides, pollution, climate change and a loss of habitat and food sources. Sensational Elora would like to make a difference by encouraging the planting of native pollinator plants throughout Centre Wellington and educating elementary school students and other community members on the importance of taking action to protect pollinators.We feel that most yards can accommodate a small garden of these plants to attract pollinators and it gives us an opportunity to get the young students involved at an early age in supporting our environment. We will also be making these seed packets available at Pumpkin Day. Choose a site with good exposure to sunlight. Prepare seeding area- remove weed, cultivate and amend soil as required, pack but avoid smoothing out the soil completely. Cover with ¼” topsoil or mulch, or harrow. Sow in the late fall or early spring, avoid summer planting. For the first year, ensure the area is kept well watered. Wild Columbine (10%), Spiked Blazing Star (10%), Blue Vervain (20%), Ironweed (10%), Butterfly Milkweed (10%), Swamp Milkweed (20%), Sweet Ox-Eye (15%), and Slender Mountain Mint (5%). For more information call us at (519) 846-5638.